as of October 2007: REMODELING/CLOSED! Kid friendliness: high chairs available though, not many booths to accomodate and lackluster service. 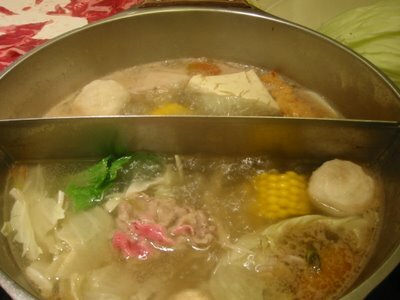 be careful of hot pot with antsy kids, but have wide menu besides hotpot and frozen yogurt at the end of the meal. Shaburi is a nice corner for shabu shabu in the basement of Dun Hua Sogo with a huge menu of choices (in English and Chinese)- you can choose from moderately price set menus of NT$399 or splurge on options like lobster or kobe beef for a lot more. There are also non-hot pot Japanese menus such as sushi, sashimi and noodles, though when I asked about their eel avocado roll, they said they were out of avocado. The service can be slow, though they have a lot of things to bring to you. First the dual sauces, then your set menu salad and your hotpot items, lastly your drink and dessert. The set menu salad is a bit sad looking, but they do offer you a shrimp. The cheapest beef on the menu is still pretty tender and comes with an array of veggies including your choice of noodle. The thing I like about Shaburi's hotpots is that each one is divided into 2 sections, so you can dine with your friend yet have control of your own pot. In this case, I was eating with a vegetarian, so we could still sit at the same table (unlike many hot pot places that have communal hot pots) and eat from the same pot. I like the sesame sauce better than the soy chili sauce, which can be quite spicy, but you can ask them to make it more or less spicy. The vegetarian hotpot comes with cabbage, mushrooms, corn, tofu, vegetarian tempura, tomatoes, taro and noodles. You can also get an upgraded vegetarian Mushroom hotpot which I assume comes with even more mushrooms. I was pretty hungry, so I ended up ordering an extra plate of sliced beef, which made my lunch more expensive than usual. The black sesame vanilla frozen yogurt gives extra brownie points to this shabu shabu place over others. You can also choose from tea or coffee and we forgot to ask for it earlier, so got it at the end of dinner. We walked into Shaburi for lunch without a reservation and it filled up fairly quickly throughout the lunch hour. I would recommend reservations for dinner or weekends especially if you have a large group. It's a bit nicer than the mom and pop hot pot places for business lunches or family dinners, though keep in mind you can have all you can eat for simliar prices at such places like Mo Mo Paradise. However, it seems that Shaburi have sprung up in NY where good shabu shabu is a bit harder to find and made a name for itself there. I spotted this random korean place on the corner on the way home from a spa appointment with my friend. It was on the corner and had a window for take away orders, sort of how some taco places have a counter for people who didn't necessarily want to sit inside. Everything was in Chinese, but there were enough pictures on the wall to point to what I wanted- they had all the main things- seafood pancake (NT$120), stone bim bim bap (NT$150), spicy stir fried rice cake (NT$100-120), hot pot (NT$100). I only had time to get something to go, so I ordered the seafood pancake. When I got back to the office, to my surprise, they included a soup, a dessert grass jelly soup and a side of deep fried taro and tofu. That was a good deal to me! The taro was so crispy it was almost carmelized. With sugar coating, it was right up my sweet tooth alley, but my guy friend who didn't expect it to be sweet didn't like it. The freebie sides and the taste of the seafood pancake definitely picqued my interest. Next time, I will try sit down at their small corner shop and see if the other menu items are just as good. 172, Sec. 4, Zhong Xiao East Rd. Six large private rooms make it a convienent place for group parties and family celebrations- very helpful and accomodating service, but both hits and misses for mutli-course dishes served. Dim sum a stand out- would like to return during lunch for dim sum in the future. The evening got off to a bumpy start as we tried to squeeze in extra seats to an already crowded, very large table of over 25 people. But the servers switched out the chairs and moved out the place settings without any complaints and as quickly as they could. It's possible we might have gotten annoyed furtive looks at another restaurant, but I didn't feel anything of the sort as we all settled in. This was a group company dinner so the menu and prices were already pre-set. Some of the dishes I thought were very tasty- such as the bamboo wrapped sticky rice - but some of the others were just overdone- just as the sweet and sour spare ribs. My pictures are in the order that the food was served. Despite really enjoying all the other restaurants at San Want, I found myself quite underwhelmed with the food overall at Chao Ping Ji. It might have been because it was a "group menu" and maybe one of the less expensive ones- however, I don't think that should be an excuse for not serving the best at that price range. The starter appetizer was not bad with the tofu and goose. The shark fin was watery and piece-y. The fried shrimp was a bit hard to eat, but tasty with vermicelli used as a wrap instead of batter or egg roll skin. The mushroom tasted better than the abalone in this dish, and the spicy XO scallop seemed a little burnt. Or maybe I don't like XO sauce- I believe I did not like a previous experience with XO sauce at another restaurant. The spare ribs looked promising and had a nice sweet glaze, but with one bite, it was obvious that they were too tough to chew with the meat cooked dry rather than being tender. Around the room, I could see waitresses taking away untouched plates from the table as it seemed many others felt the same way. Despite the sauce on top, I found the actual fish itself to be a bit bland. I just was not having any luck with the seafood here. The sticky rice and the "char siu sau" was the saving grace of the dinner. It brought the flavor and yum factor that had been missing all night (or maybe I was especially hungry at that point). The char siu sau was flaky and the bbq pork inside was sweet. The sticky rice, well really, how can you mess with sticky rice? I quickly devoured my portion and eyed the others on the table, but didn't say anything. By the time the tapioca dessert came, I was ready to head home. Taipei Fun says that Chao Ping Ji was "voted as one of the best Chao Chow restaurants in Taipei" so maybe I'll have better luck ordering ala carte or dim sum next time. kid friendly? : Extremely. With both high chairs as well as booster chairs, kids menus, balloons, crayons and family ambience. TGIF was one of the most kid friendly places in Taipei with its American style "extras." I think we unintentionally went Tex-Mex at this meal at TGIF. Usually, I prefer the atmosphere and food of Chili's to TGIF, but today at the Miramar location, I was pleasantly surprised. They had a special promo for appetizer, main dish and dessert for NT$599 (US $18). It sounds like a lot for lunch, but it was a lot of food! We chose the nachos, chicken fajita tower and chocolate cake dessert since they had run out of mud pie. The nachos are less strange than the individually plated nachos at Chili's, but still no sight of the movie theater liquidy nacho cheese here. Pretty standard with jalapenos, sour cream, pico de gallo and guacamole to dip. I don't know what I thought would be different about the chicken fajitas tower- it's basically just way to save room on the table by stacking the guac, salsa, cheese above the sizzling plate. I found the Signature Jack Daniel's chicken fajita's tower to be slightly too spicy and watery for my tastes. I preferred the way the chicken and steak is grilled at Chili's because the meat is more tender and doesn't make your tortilla soggy when you wrap it up. The double decker chicken quesdilla plate was pretty extreme- lots of cheese, but it was good. Hot and crispy- I liked this better than the fajitas. I wish they had given us more pico de gallo rather than salsa, and the yellow "Mexican" rice was mysterious. Typically, this chocolate cake dessert comes with chocolate mousse, but I don't like mousse and the waitress said they could make it ala mode instead. That was perfect! The cake was soft and light, yet very chocolately. Not as heavy as the mud pie or Chili's warm chocolate cake, but then you feel a little less guilty. You'd find pretty much everything you'd expect with TGIFridays in the states- similar menu with huge portions including salads, pasta, ribs, hamburgers, sandwiches, appetizers, drinks and desserts, same bar/decorations, even the waiters have the same red and white stripe uniforms. It seems like the waiters at these international chains have been trained to have American style customer service- to give the customer a pleasant dining experience- unlike Taiwan service which is hit or miss depending on the venue. The last time I went to a Taipei TGI Fridays was awhile ago and at a different location- I didn't love the greasiness and heaviness I felt after the dinner of I don't even remember what we ordered. Ribs and salad? 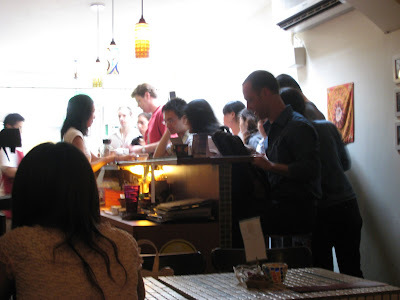 I also think that the Miramar location was more airy and bright with lots of windows than the other locations I had previously been to, I think on Keelung and Chung Hsiao, and it helped that they were so extremely kid friendly to our party. I don't know if some branches' food and service are better than others--- any opinions?? All in all, it is what it is. You probably won't here if you are coming from the states, looking for the beef noodle soup on Yong Kang St. But if you have been here for awhile and need some Tex Mex or Jack Daniel's ribs for your birthday party of 8, then TGI Fridays is not a bad place to be. Googled around for the different locations of TGIF and could find only 1 Taipei Times article. The US website froze on a blank page with loud music, but no Taipei info in sight. Finally searching for TGI(space)Fridays, not TGIF Taipei or TGIFridays Taipei. I finally found some random information and then the Taiwan site for TGI(space)Fridays, but with addresses only in Chinese. So until I find my business card, here is what I gathered. You would think that it's not THAT hard to put English addresses for an American restaurant on your official website for all your non-Chinese reading patrons looking for info. Maybe they think that you automatically know where the restaurant is since you'd pass by their signs or your friends will take you there? TGIF and Company, are you listening?? Please put English addresses on your website. Thanks! Okay, so both fashionfoodculture-life and chocolate and sage tagged me with the chain-letter to declare 7 random things about myself that you probably don't know and then pyramid scheme it along to 7 other people on their blog, leaving a comment on their blog that they have been tagged. Each player starts with 7 random facts/habits about themselves. People who are tagged need to then report this on their own blog with their 7 things as well as these rules. They then need to tag 7 others and list their names on their blog. They are also asked to leave a comment for each of the tagged, letting them know they have been tagged and to read the blog. (1) When I was in elementary school, I received a sticker chain letter where you were supposed to send a sticker out and then receive TONS of stickers when it was your turn. I sent mine out, but didn't receive ANY. (2) I twisted my ankle in the 7th grade playing volleyball and had crutches for two weeks. (3) I won the city wide spelling bee in the 4th grade. But was tramautized when I lost from the word "pastoral" in the 5th grade. (4) I haven't seen Star Wars 4, 5, 6 or any of the Rambos or Rockys or Star Trek movies or until recently, any of the Godfathers. But I have seen almost every romantic comedy, good and bad, from the past 15 years. (5) I learned how to program BASIC from 3-2-1 Contact magazine, and taught 5-10 year olds how to do so at computer camp for one summer after I graduated from college. (7) I still love Hello Kitty and cute stationary type things. I have all my old stuff and can't resist the temptation whenever I pass by a store. I have a Hello Kitty sandwich maker, toaster and waffle maker (the sandwich maker works the best!). Even the new 7-11 collectibles have me drooling. As you saw with item number 1, I don't have much luck with chain letters. But hopefully these friends, some I know well, some I've only met online and hope to have a foodie lunch with someday, will change my track record. You're it! I know everyone is in love with Ice Monster and mango ice, but for classic shaved ice flavors, you have to try Tai Yi Milk King. And I'm not talking about creamed corn. Red bean. Fresh rice mochi balls. A drizzled layer of evaporated milk over snowy ice. I had never been to or heard about this place before I went with some friends late last month. All you hear about is Ice Monster. But this place has been around for ages with lots of choices for you to appreciate. You could try something different every night for a week! Filled with mostly locals and a menu of both icy cold shaved ice (NT$45-80) and soupy hot rice balls, you might have to send someone to claim a seat first even though there is two floors of tables. Probably a lot of college students since it's so close, right across the street from National Taiwan University. Is it Taida or Tai Da- anyone know? If you must do the mango ice, they have that here too- and it looks just as good, but without the plop of mango shebert excess. Or go for "ba bao bing" which is like a mix-in of everything popular like green beans, red beans, tapioca balls, peanut and some other unidentifiable stuff. But I prefer the clean lines and flavors of the red bean and "xiao tang yuan" which is made fresh and slightly fatter and chewier than the frozen and boiled white and pink variety that you will spot at most other shaved ice places. Once you have this, you can never go back! I went back a few weeks later and got the same thing- though the first time was definitely better than the first. There's nothing like love at first bite. Look for these signs if you are taking a taxi or walking.. The white sign is the front facing the street, the blue one is from the sidewalk. There is also an Adidas store a few doors down and Tequila Sunrise a few blocks away. If you don't mind eating something hot during the summer, or want something during the winter, try the "tang yuan"- filled with sesame paste and bathed in a rice wine soup. Apparently, it was voted by 30,000 voters as the top place in Taipei to go to for yuan xiao AKA "tang yuan" AKA mochi rice balls filled with stuff. Second place? Jiu Ru on Ren Ai Road. Nice... I'm on top of the Lantern Festival favorites. Tai Yi shaved ice is available until midnight every night. Awesome. PS When I start having three posts in a row with ZERO comments, I start getting nervous! Not interested in hummus and hotcakes??? Without sounding too girly, I really do love hearing from you guys! Kid friendliness: Who hasn't been here as a kid? High chairs available and some McDonalds here have small playgrounds. Seasonal toys with the happy meals are collectible! It's classic, it's fast and it's affordable. Sure, it's not the healthiest thing in the world, but neither are eggs benedicts! It's almost the same you'd find back home and definitely quicker than when you don't have time to wait in line at NY Bagel or the Diner on the weekends for American style breakfasts. Offering breakfast sandwiches on McMuffin or bagel (NT$30-40 only sandwich/$65-75 combo) - you can have egg, sausage, cheese or bacon in various combos as well as hotcakes (NT$40 alone/NT$75 combo). Don't forget to get the hash brown (my personal favorite!) and an OJ or coffee or milk to go with it. Even the packaging looks familiar with the bold sans serif lettering paper wrapping or styrofoam plate for your hotcakes. The service will vary depending on location, but there will be plenty of picture menus for you to point to what you want, even if the server doesn't understand "hotcakes" or "hash brown" in English. The hotcakes come with the prepackaged super sweet syrup, but they are perfectly round and soft and hot as if you griddled (or microwaved them) yourself. Somehow everytime I eat McDonald's hotcakes I'm reminded of when I went camping with my girl scout troop and saw for the first time someone make perfectly round American style pancakes that would slowly turn golden and fluffy- as opposed to the odd shaped homemade crepe style pancakes my dad would concoct out of flour and butter and sugar at home. So I have a special place in my stomach for hotcakes, especially since these are a huge improvement over the hockey pucks from NY Bagel. Personally, I like the biscuit better than the mcmuffins since I think the mcmuffin tastes a little more 'preserved'- but they don't have that option here. I also wanted to get some of the berries and yogurt parfait, but they didn't know what I talking about at this location. Now that I think about it, they might not have brought that into Taiwan at all yet. Also, if you spot the McCafe locations around town, they have more specialized coffee/lattes as well as waffle options though it's more like an afternoon tea snack here. The seating is more cozy corner coffeeshop like and less fast food plasticky than the regular McDonalds. Lastly, the Minute Maid orange juice tastes like standard semi-pulpy OJ rather than the more watery or sugary versions of orange juice that you might find from some local brands. I heard that some McDonalds back in the states might have breakfast available all day. That would be awesome! I remember some mornings trying to get myself out of bed in time to the 10:30am cut off time and going to the drive through in my pajamas. Something about the hash browns really gets to me- the crispy hotness when you bite into it. You can't eat it everyday, but once in awhile it's a treat. Kid friendliness: no high chairs and small seating area - so tough for strollers, though finger foods quite kid friendly. Recommend calling ahead and getting food-to-go if you have lots of kids or baby. The hummus here will make you hum about Sababa to all your friends afterwards. And if you've never had hummus before, you should give it try and have one of their sandwiches as well. After having it a few weeks ago, I had been thinking about the food ever since. It's simple and light and easy on the wallet- yet there are complex and hearty flavors in the food. They have pita sandwiches (NT$98) and plates (NT$158) with combo option of adding fries and a drink (add NT$50). So last night, I got some more Sababa food to go and I have to say it traveled better than I thought it would back to my dining table. The first time, I made the mistake of just ordering a hummus combo plate, the plata sababa (NT$158), as my lunch. Hummus is a creamy blend of chickpeas and sesame tahini with lemon and garlicky flavors to keep everything interesting, and plated with the roasted eggplant gives it a slightly sweet partner to dip your pita bread in. 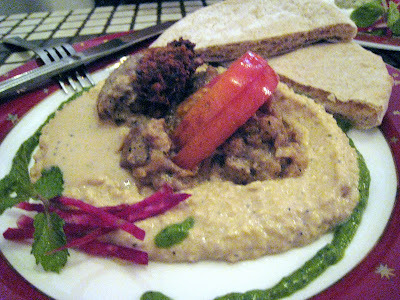 While it was sizeable- it was more like an appetizer with a plate full of hummus, roasted eggplant and sliced pita to dip it in. I had to ask my friends to try it out so that I didn't feel forced to finish it- all hummus and pita and no meat was starting to feel a bit heavy and I was eyeing my friend's combo pita sandwich. my friend's combo sandwich, not my chicken pita! This time, I was smart, I ordered a Chicken Soulvaki Pita (NT$98) as my protein and the plata sababa to share, as well as some Moroccan cigars (NT$88 for 2) on the side. Everything came in paper bag (smartly imprinted with Sababa's info and a map) so the cigars stayed crispy and didn't get soggy like some fried foods to-go do. My chicken pita was stuffed full of large diced chicken breast pieces with some tomato slices and filled with green homemade yogurt sauce which made the sandwich moist without being too greasy (like mayo). 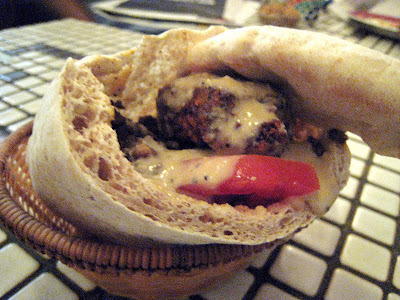 The pita was soft and fresh- and they even stuff the part they cut off into your sandwich- which I promptly used to dip into the hummus. 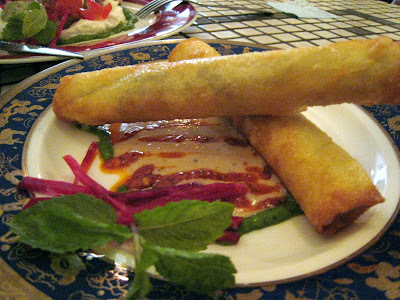 The Moroccan Cigars were like I remembered the first time- a bit spicy with ground beef and pine nuts, wrapped in long cigar-like egg roll skin, deep fried and crispy. It's usually made with phyllo dough, but the egg roll skin gives it a unique fusion twist which is perfect to cater to the Taiwanese tastes without taking away from its original flavor. My vegetarian friend had the Egyptian Cigars (NT$88 for 2), which were made from spinach and herbed cheddar- but must warn you, it's quite spicy! Much spicier than the beef and without warning on the menu. I also didn't spot any spinach in my bite, but he liked it. I think I also like it because it reminds me of taquitos and while it's quite different, it's similar enough to make me happy. It's not easy to find since it's located off in the alley off a lane off a street, but check out their map on the website and look for the red sign hanging outside their little shop. They also don't have any sweets/desserts, so if you are still hungry afterwards, you can get a smoothie or drink next door, especially on a hot day. (I got the guava/grapefruit juice and it was very refreshing and surprisingly good combo). 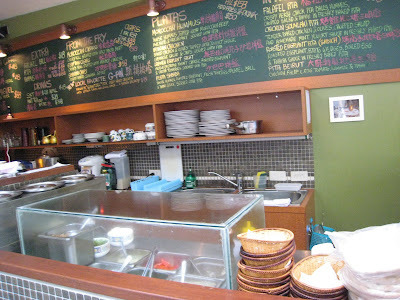 The English menu is written on the chalkboard behind the counter, as well as menus with both English and Chinese floating around the front. You order at the bar as well as pick up your own food when your number is called and I recommend getting there a little before noon to beat the lunch college crowd to get a seat. We lucked out by doing just that and getting a table in the back before it quickly filled up. There's probably no more than 18 seats or so as well as seating at the pita bar, and it feels sort of like fast food joint with all the tiled tables, but a wee bit nicer. They also make everything to order, so if you get there before the rush, you don't have to wait extra long to eat! If you are getting food to go, I recommend calling ahead so you don't have to wait. Also, to-go orders are buy 5 get 1 free, so try something different next time for your office lunch or order food to go and let the kids try something different. There's also quite a few options for vegetarians that are filling and satisfying for even non-vegetarians. 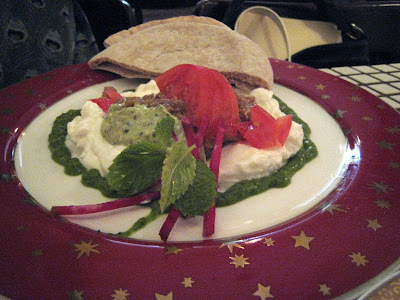 Besides the plata sababa and Egyptian cigars, there's also an Eggplant or Falafel pita sandwiches as options, or the Labneh Eggplant Salat, which had a lot of homemade yogurt cheese - which is more an appetizer plate rather than a lunch or dinner plate as we discovered. Opened by the same people who brought Citizen Cain to Taipei, Sababa has quickly gained many loyal customers. 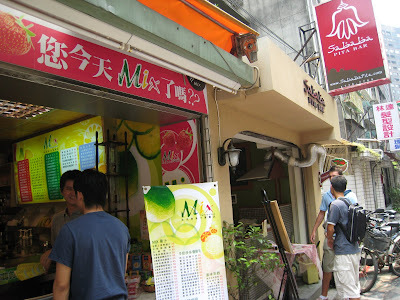 I heard a lot about it on the various Taiwan forums before getting a chance to visit and now they have opened another location, as well as offer franchising opportunities- so you might see more and more Sababa's around town. Our dinner to go was NT$530 (US$16) for 2 sandwiches, 4 cigars and 1 plata sababa and very satisfying- can't beat that price at most of the western/foreign eateries in town! Even in LA, 2 pita sandwiches, hummus and sides would be about the same, maybe even more. It's too hot to blog. If it's not raining, the sun is out to get us with its global warming revenge. But here are some things I've been eating to beat the Taipei heat. Cold ramen noodles at Watami (can you spot the ice cube?). Even better- I found the Korean cold noodles in a sweet and vinegary-sour soup I loved from Korea in Yonghe. I've been day dreaming about the mint chocolate chip ice cream from Movenpick ever since I shared a banana split. And of course, shaved ice. Shaved ice is one of the best things about living in Taipei! Can we eat it everyday? I know it's not nice to tease you with the pictures and not tell you exactly where to get them. I'm working on the reviews and the restaurant name and address translations. Blame the restaurants for not having English on their business cards and websites!!!! Hope everyone is staying cool. So their pastrami sandwich (NT$260) doesn't look like this- but their burgers and fries (NT$120-260) are pretty close to what you'd expect if you were in some burger joint in the states, with all the trimmings as options (NT$20-30)- swiss and mushrooms, cheddar and bacon, pickles/tomatoes/onions and self serve mustard and ketchup. The only thing I wish they had was Haas avocado slices as a add-on option. It's also almost half the price as a burger you'd get at Chili's. You can also pair your burger with a icy cold milkshake (NT$120-160) or yogurt/fruit smoothie (NT$120). This time around, I even discovered their off the menu dessert counter with temptations (NT$90+/slice) like key lime pie, cheesecake, carrot cake, pumpkin pie & non-desserty but equally delicious looking quiche! The service can sometimes get a bit slow especially when they get packed and backed up, but that's why you self serve your coffee and water. We also had to wait about 15-20 minutes for a table for 3. I got a carrot cake slice to go and it was tough to pick one! Tall, three layers and calling out my name the next day- the cake would be just what Bugs Bunny would order from his baker with lots of cinnamon and grated carrots, but the frosting was not cream cheesy at all. Instead it was a bland white frosting that committed a sin against the flavor of the carrot cake. Still can't beat their American style breakfasts (NT$150-240)- this is especially evidenced by the sight of other customers busting out their cameras and artily taking pictures, perhaps for their food blogs, asking their friends to move all the background stuff out of the way and making them wait to eat their plates while they get just the right shot. See what I said last time I went to the Diner. where is everyone (from) ?